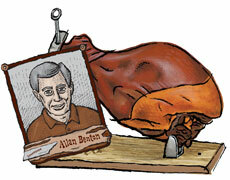 Allan Benton's Country Ham for sale. Buy online at Zingerman's Mail Order. Gourmet Gifts. Food Gifts. When it comes to flavor, Allan Benton doesn't do middle of the road. "People either love it or hate it," he says about his ham. Each fifteen pounder is dry cured for more than a year and smoked over hickory. The smoke hangs over the ham like an aura. The flavor is intense, deep and complex. Not for everyone. I recommend eating it as is, sliced thinly like you would for Italian prosciutto or Spanish cured Jamón. After all, it’s cured essentially the same way. To slice, use a sharp knife and work the ham lengthwise. Don’t worry about getting big slices—focus on keeping the pieces thin, and make sure your bite has a little bit of meat and fat. Shipped without ice. It's been cured at ambient temperatures through Tennessee summers, so it's built to last. Download our Country Ham Storage and Slicing instructions.